Albatros Palace Resort Hurghada has been certified as Green Star Hotel, the Green Star Hotel (GSH) is a national green certification and capacity-building program managed by the Egyptian Hotel Association (EHA) under the patronage of the Egyptian Ministry of Tourism. 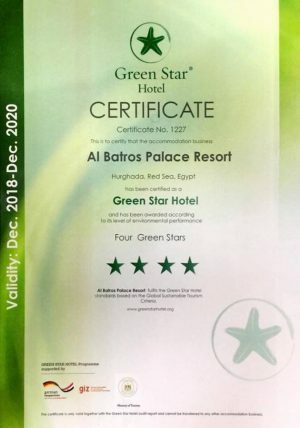 The GSH program offers an opportunity for hotels operating in Egypt to be internationally recognized for raising their environmental performance and social standards while reducing their operational costs. A team of certified local and international experts guide interested hotels through a sequence of training and information support sessions leading to field audits to ensure compliance with the program standards prior to granting the GSH certification.